Coloplast Bedside Care Body Wash Shampoo Incontinent Cleanser is an all-body, no-rinse spray cleanser for those who are bed-bound. Provides a gentle, refreshing and thorough cleansing while eliminating body odors. Bedside-Care Body Wash and Shampoo is a no-rinse, all-in-one body wash, shampoo and Incontinence Cleanser. This particular cleanser comes lightly scented. It's possible that we may be able to special order one without a scent through the manufacturer. Feel free to give us a call at 800-397-5899 and speak with a customer service representative to see if it can be ordered on your behalf. Is this the spray or the foam? I am looking for the foam. This product is a foam cleanser and will discharge as foam. I'm pleased to find this product for a price that I don't mind paying. This product does not foam, it comes out liquid. Love this product - but where's the Gallon size? This is a Great product...so much so that I literally bought it by the gallon last time. I came back today to reorder and find that it is no longer being offered in that size. I hope that it is just temporarily out of stock. Not available in the gallon size anymore? As a nurses aide I am responsible for the personal care of some seriously incontinent patients. This product thoroughly cleans and refreshes even the toughest cases. Have used this stuff for years for personal hygiene. Love it. Great price too! I recently spent a few days in the Joint Academy for a total hip replacement, and they supplied this product for their patients. I fell in love with the way it cleansed so thoroughly while remaining very gentle, (I use it on my face every morning) that I went online to find it. I purchased an entire case! Thank you for making this product available to the public! Get everything done in bed! I am a caregiver to my old aunt. The hardest thing for both of us was to clean her since she cannot get out of her bed. I used to use water but it was not so convenient. This spray is great in that way because you don't need to rinse afterwards. It made our lives much easier. So great. 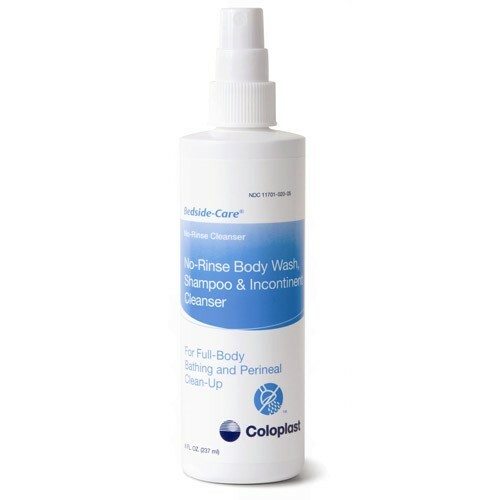 The Coloplast Bedside Care Body Wash is the greatest product for anyone and everyone to use! It has a great, clean scent, and is easy to use in the handy spray bottle. It is especially useful for people who go camping, in areas with no showers available. I wonder why it is not included and recommended in camping gear magazines and websites, as it is such an outstanding product! I order it by the case, the whole family uses it, and Vitality Medical has very fast shipping and is very reliable!